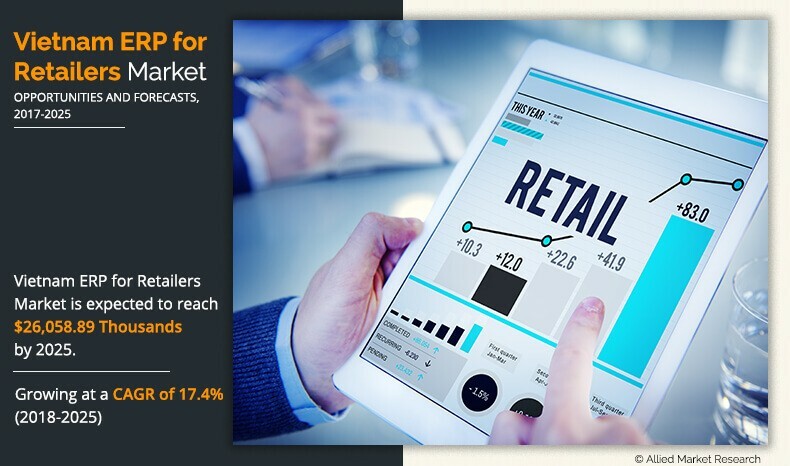 The Vietnam ERP for retailers market was valued at $7,271.94 thousands in 2017, and Vietnam ERP for retailers market forecast is projected to reach at $26,058.89 thousands by 2025, growing at a CAGR of 17.4% from 2018 to 2025. An enterprise resource planning (ERP) software, is a business process software, which enables retailer organizations to collect, store, manage, and analyze data from different business activities at one single point for overall higher productivity and smooth functioning. The Vietnam ERP for retailers market size has been growing at a rapid rate, and is expected to maintain this trend during the forecast period. There is an increase in the demand for ERP software among retailers to improve consumer satisfaction and operational efficiency of their businesses. ERP is used among retailers for several number of applications, such as inventory management, demand forecasting, store and warehouse operations management, and so forth. In addition, emergence of cloud-based ERP software and rise in demand for ERP among small and medium retailers are expected to drive the growth of the Vietnam ERP for retailers industry during the forecast period. The on-premise ERP segment dominated the overall Vietnam ERP for retailers industry in 2017, and is expected to continue this trend during the forecast period, owing to rise in penetration of an ERP system in-house to help enterprise administrators in monitoring, managing, and improving their business practices. However, the cloud based ERP solutions segment is expected to exhibit the highest growth rate during the forecast period. Several factors such as low cost, customization and integration with third party application can be attributed to growing adoption of cloud enabled ERP software. Cloud based ERP software is preferred by end-users when they have low budget and less in-house IT infrastructure. The report focuses on the growth prospects and restraints of the market based on the Vietnam ERP for retailers market analysis. The study provides Porters Five Forces analysis of the industry to understand the impact of various factors such as bargaining power of suppliers, competitive intensity of competitors, threat of new entrants, threat of substitutes, and bargaining power of buyers on the growth of the Vietnam ERP for retailers market. The Vietnam ERP for retailers industry is segmented into component, application, deployment model, and retailer size. Based on component, the market is bifurcated into software and service. The applications covered in the report include customer management, demand forecasting, inventory management, store & warehouse operations management, purchase & vendor management, employee management, and others. Based on deployment model, it is categorized into on-premise and cloud. According to organization size, Vietnam ERP for retailers market is classified into large retailers and small & medium retailers. The key players profiled in the Vietnam ERP for retailers market analysis include Deskera, Epicor Software Corporation, Exact, IBM Corporation, Infor, Microsoft Corporation, Oracle Corporation, Plex Systems, Inc., SAP SE, and The Sage Group plc. 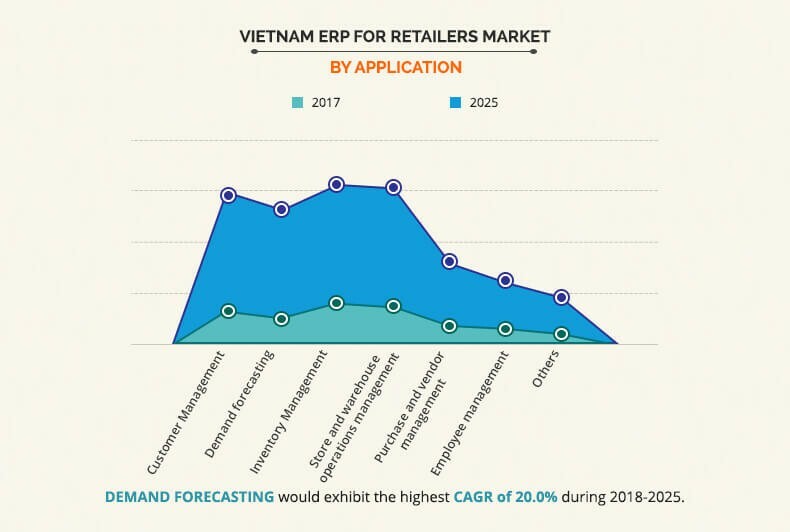 Rise in need to improve business efficiency and transparency, increase in demand for role based security, and growth in adoption of ERP among retailers majorly drive the Vietnam ERP for retailers market growth. However, high investment costs and inadequate flexibility are expected to hamper the Vietnam ERP for retailers industry growth during the forecast period. Furthermore, increase in demand among small and medium retailers is Vietnam ERP for Retailers market opportunity. Traditionally, businesses with the help of homegrown applications spend a lot of time and effort in communicating business information and making decisions. Organizations aiming at becoming successful are continuously looking out for systems that will help them serve their clients and increase their profit margin. Today, ERP systems have become strategic platforms, providing a solid foundation and information backbone for businesses. A fully integrated ERP system helps to capture and create accurate, consistent and timely relevant data and assist to take better business decision. Offering personalized services and ensuring that customers are satisfied do not affect the profitability of an organization unless the operating efficiency of a company is exceptional. Companies are now looking at ERP systems to improve efficiency and ensure a better information integration. Organizations need to access all relevant information quickly to take a necessary business action owing to increased competition and rapid changes in business environment. It can be achieved only if the organization becomes more transparent and open. Thus, an ERP system that can scale and deal with the global competition while introducing efficiency and transparency in operations is expected to gain a strong foothold in the market within the forecast period. This contributes to better retailers and their customer experiences, which is expected to drive the Vietnam ERP for retailers market during the forecast period. ERP software being an essential system for enterprises and large businesses offers integrated applications for managing the business and systematize many back-office functions related to services, technology, and human resources. As enterprises grow business across different countries, it becomes difficult and hard to keep track of the various business environment and information security, which is the major factor driving the adoption of ERP software in enterprises. Moreover, data is the main part of the ERP concept; sharing the data across various platforms, such as customer service, marketing & business development, and sales also creates the necessity of the role-based security platform. However, ERP systems on-premise and cloud offers the organizations higher degree of security, also cloud-based ERP systems offer an extra layer of security as the security experts ensure that their servers are protected 24x7. Furthermore, role-based security enables employees to access the functions related to their job duties, while restricting the access to other irrelevant functions as they cannot go beyond their role, which is also one of the major factors that drive the growth of the Vietnam ERP for retailers market. 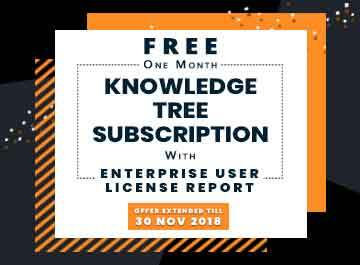 For instance, according to a survey of over 200 Global, 2,000 IT managers and executives cooperatively conducted by Stanford University and Hong Kong University of Science and Technology, nearly half the organizations stated that it took more than two weeks to revoke the network access of their terminated employees, which creates the need to adopt the role-based security platform. In addition, the survey also indicated that help desk costs can be driven down by more than $1 million yearly by implying the secure identity management approaches. In the Vietnam ERP for retailers market, majority of software vendors are offering ERP software for both large retailers and small & medium retailers. The initial investment to acquire and implement an ERP system is substantial. The global software vendors such as Microsoft, SAP, Oracle, and IBM Corp., charge high cost for their solutions. In addition, these software vendors also charge high fees for maintenance and support function. The total annual cost of maintaining and updating the ERP system includes internal cost (user training, salaries for IT, and project management), external costs (IT vendors and contractors), and maintenance and support fee paid annually to the application vendors. Software providers charge higher prices due to which enterprises are not ready to spend more on applications. End users are not showing willingness for upgrade and renewals due to high cost of these services. Thus, the high investment and maintenance costs are expected to hinder the growth of the Vietnam ERP for retailers market. This study includes the analytical depiction of the Vietnam ERP for retailers market trends along with future estimations to determine the imminent investment pockets. The current Vietnam ERP for retailers market is quantitatively analyzed from 2017 to 2025 to highlight the financial competency of the industry. Porters Five Forces analysis illustrates the potency of buyers & suppliers in the Vietnam ERP for retailers market. Retailers have started implementing enterprise resource planning solutions for numerous reasons, including high efficiency, reduced costs, and enhanced customer shopping experience. In addition, an ideal ERP solution can provide a number of additional benefits to retailers, such as streamlining financial information and inventory management, helping them in demand forecasting, and so forth. The major factors driving the ERP for retailers market in Vietnam include rise in demand for operational efficiency and transparency, owing to numerous challenges such as rise in stock, higher number of employees, and so forth. In addition, Vietnam retail industry has been growing at a significant growth rate, which is constantly motivating the retailers to increase their ICT spending for better business outcomes. In current landscape, two models of ERP software—on-premise systems and cloud-based—are used among enterprises. The ERP for retailers market in Vietnam is fragmented and competitive, owing to the presence of well-diversified international and regional vendors. However, existing presence of international vendors in the country makes the marketplace highly competitive. Companies such as Oracle, SAP, Microsoft, and Epicor Software Corporation have been some of the major shareholders in the market. In addition, various local vendors are also contributing significantly to the market Some of the key players profiled in the report include Deskera, Exact, IBM Corporation, Infor, Microsoft Corporation, Oracle Corporation, Plex Systems, Inc., SAP SE, and The Sage Group plc. These players have adopted various strategies to enhance their service offerings and increase their market penetration. "Vietnam ERP for Retailers Market"